About twice a week, the boys and I bake cookies. Sometimes, we get all creative and use M&Ms and candies and different kinds of chocolate chips and cover the kitchen in flour and sprinkles. But, many days, the key to baking happiness for all of us is simplicity. We often bake great-tasting cookies that are easy to make and easy to clean up. 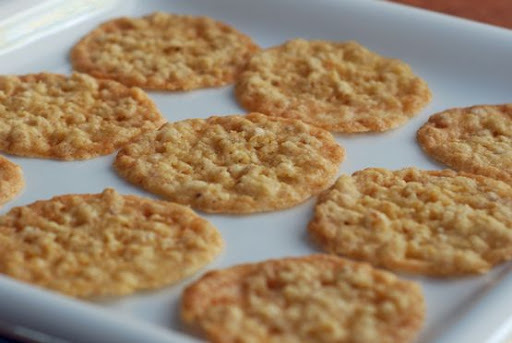 These Oatmeal Crisps are one of our favorite, "easy" cookies. We make them a couple of times a month. They are a light, crisp cookie that uses ingredients we always have on hand - so we can decide to bake these at the spur of the moment. And, one batch makes about 100 cookies, so we usually bake about half of them, and then save the rest of the dough in the refrigerator for another day. I often refer to these as "the diet cookie". They're not lowfat or any such thing. Heavens, no - I do have a reputation to maintain. But, 1/2 teaspoon of dough makes one regular-sized cookie. To put that in perspective, when we bake Mom's Chocolate Chip Cookies, we use a regular-sized ice cream scoop. That's like twenty-seven 1/2 teaspoons. So, you can eat a whole boatload of these before you've eaten even one chocolate chip cookie. Yeah, man. Preheat oven to 325 degrees. Place aluminum foil over baking sheets and thoroughly coat with nonstick cooking spray (or with softened butter). In a medium bowl, combine the oats, flour, salt and baking powder. Set aside. In a mixing bowl, combine sugar and butter with an electric mixer. Add the egg and vanilla extract; beat until smooth. Add the flour mixture and blend just until combined. Drop the dough by 1/2 teaspoonfuls (about 3 inches apart) onto cookie sheets. Bake for 10 to 12 minutes, or until the edges begin to turn golden brown. Allow cookies to cool, then peel the cookies from the foil with your fingers. Be sure to respray the cookie sheets between batches. Hey ... if it has oatmeal in it, it must be healthy. This sounds delicious! Do you think parchment paper would work in place of the aluminum? I'm always looking for new recipes to try and yours have always been a hit. In fact, was planning to bake some of Mom's Choc Chip cookies today - that is, until you laid on the guilt...haha - just kidding - I'm still feeling draggy but I want to make them for T and his drivers who are up at 1am for a concrete job and still working til 5pm. Hopefully the kids can muster up the energy for me!! cookies twice a week?? i don't know how you do it!! i make cookies once a quarter and spend the rest of the 3 months working off the gained weight! seriously! i'm so impressed that you are so trim! OOh, these look so good and easy to make. I think my girls and I will attempt them tomorrow afternoon as a treat for their babysitter :)! I bet parchment paper would work great! They'd probably peel off of it quite easily! mmm, these sound yummy. I'm going to try them for sure. I'm sure these are good because all your recipes are! Thanks! Thanks girlie... I think I am going to try these with the kiddos tomorrow afternoon!! Those look really good. My husband adores oatmeal cookies - I wonder if he'd like these? They remind me of the Pepperidge Farm cookies with chocolate on one side. Hmmm.... might have to try em! Made this this morning for a Linger Longer after church today. Hubs LOVES them!! (I had to substitute shortening for the butter, due to a nursing baby who doesn't do well with dairy...bet they'd be even better with butter!!!) In hindsight, I probably should have added a bit more flour - the shorteningspreads a bit much. I can't believe you bake cookies twice a week. I mean, I can believe it given how much you love it, but still...where on earth do you find the time. I know that's the whole point of these cookies, that they're simple. Maybe I need to just make them. LOL. Hope you feel better very, very soon!!! Have you ever froze these? Think they would stay crispy? I haven't ever frozen these, but I bet they would freeze beautifully. 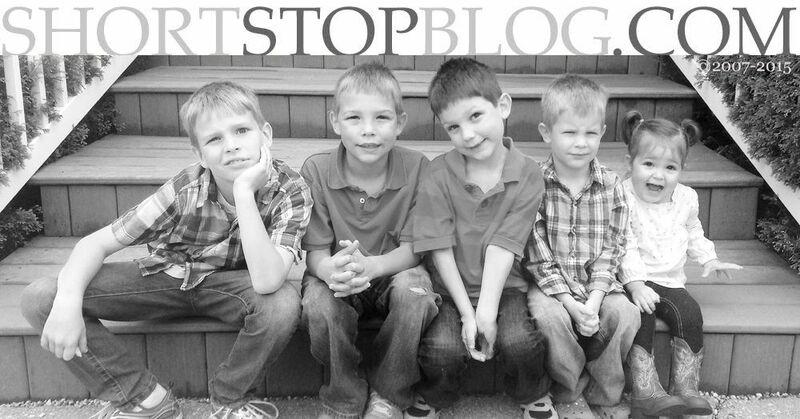 I stumbled upon your blog through your post to Moms of 1 or 2 kids. I just recently had my third and things are just starting to get easier. Lol. I tried these cookies as the first thing to make from your recipes. (I have saved over half of your recipes to try.) These are soooo good! I used parchment paper and it worked great, the cookies just popped right off. I have water boiling right now to try your hot chocolate recipe. Mmmmm. Thank you, I am loving your blog. I just made these since I had a major cookie craving. Wow! They were so good and so easy! I used parchment paper, and it worked beautifully. I made 45 cookies and stuck the rest of the dough in the refrigerator for later in the week. I loved these and will be making them on a regular basis. Thank you! I made these with a few substitutions to make them vegan, and they turned out SO GOOD!! If you are on an elimination diet like I am, have a lot of allergies, or whatever ails you, these subs worked amazingly well and this will be my new go to cookie forever!!! Thank you so much for the recipe! I even made a larger cookie, promptly laid it on top of a small dish while hot to form a “bowl” then put in a scoop of almond milk ice cream. Uhhh YUM! !